Claudia Schmidt doesn’t like to be boxed into one category. 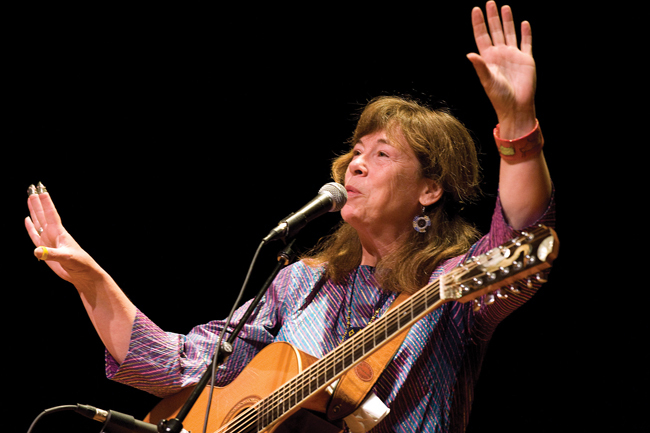 Her music draws from folk, jazz, and blues, but she prefers to describe herself as a “creative noisemaker.” Over the course of 14 albums and close to four decades as a touring professional, she has used her 12-string guitar and mountain dulcimer, along with her dazzling voice, to create her own uniquely agreeable sound, a little jazzy, a little folky, a little funky, and a whole lot of fun. Her live shows are joyful and spontaneous, often venturing into unexpected territory, including solemn hymns, bawdy verse, torch songs, and funny stories. Claudia, a Michigan native, has appeared frequently on A Prairie Home Companion and Mountain Stage. The public television station in St. Paul, Minnesota featured her in a documentary, I Sing Because I Can’t Fly, and she also participated in the delightful Les Blank documentary, Gap-Toothed Women, contributing a song as well as an interview. She has played with Beausoleil, the Violent Femmes, Peter Ostroushko, Dean Magraw, and Sally Rogers, among others, and won a Jefferson Award for scoring Frank Galati’s production of A Good Person of Szechuan at the Goodman Theater in Chicago. Her music was also recently featured in the documentary Motherhood Manifesto produced by John DeGraaf and the folks at moveon.org. For an evening of joyful noise from an extremely creative noisemaker, catch Claudia Schmidt at the Freight!